A deep-fried fluffy Indian bread that can be eaten for breakfast, lunch or dinner as an accompaniment to a variety of dishes. Make small (1 inch diameter) balls from the dough. Flatten it slightly. Avoid dusting too much flour each time as it will leave a burnt residue in the oil. Alternatively, you can apply a little oil on the rolling surface and roll out pooris, so that the dough does not stick to the board. Spread the rolled out pooris in a plate and start heating the oil in any round-bottomed frying vessel. To check if the oil is hot for frying the pooris, drop a small piece of dough into the hot oil, if it sizzles and comes up to the surface immediately, then it is ready. If the dough becomes dark brown, then the oil is too hot. Fry the pooris one at a time. When the oil is hot enough, take one rolled out dough and gently slide it from the side of the pan into the hot oil. 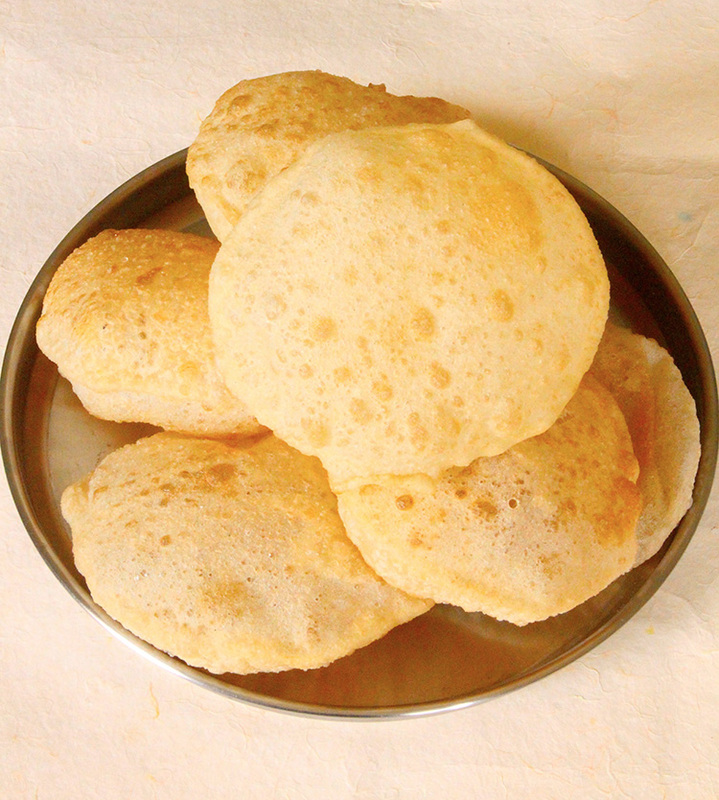 After a few seconds, slightly press the poori with the slotted ladle and flick hot oil on top of it. This will help the poori to puff up nicely. Flip to the other side and fry till golden brown. Remove with a slotted ladle and place it in a colander to drain excess oil. Repeat the process for the rest of the dough.